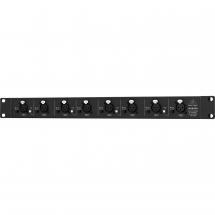 The Behringer SD16 is an I/O stage box with 16 remote-controlled Midas preamps, 8 outputs, EAS50 network functionality and an Ultranet personal monitoring hub. This stage box every live audio engineer's dream! The setup and installation is easy, and virtually all parameter controls are located on the console itself, including Midas mic preamps and +48V phantom power. The revolutionary Ultranet technology makes a 24-bit digital audio and control data transfer possible via a single Cat 5E cable. What's more, Ultranet ensures zero RFI and signal crosstalk. Setting up this system is a piece of cake, and SD16's integrated Ultranet hub delivers phantom power via CAT5 to your P16-M monitor mixer without the need for an external power supply. 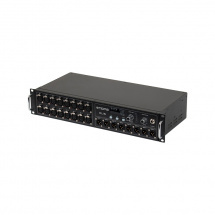 The Behringer SD16 is an extremely versatile 16 x 8 digital stage box with remote-controlled Midas mic preamps, Klark Teknik AES50 connectivity, and a broad range of functionality, all at a very affordable price. 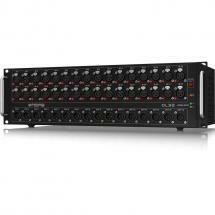 The SuperMAC technology gives the SD16 its high capacity and extremely low latency. Klark Teknik's engineers have worked closely with Behringer to make sure this SD16 meets every demand of today's live entertainers and their audio engineers.